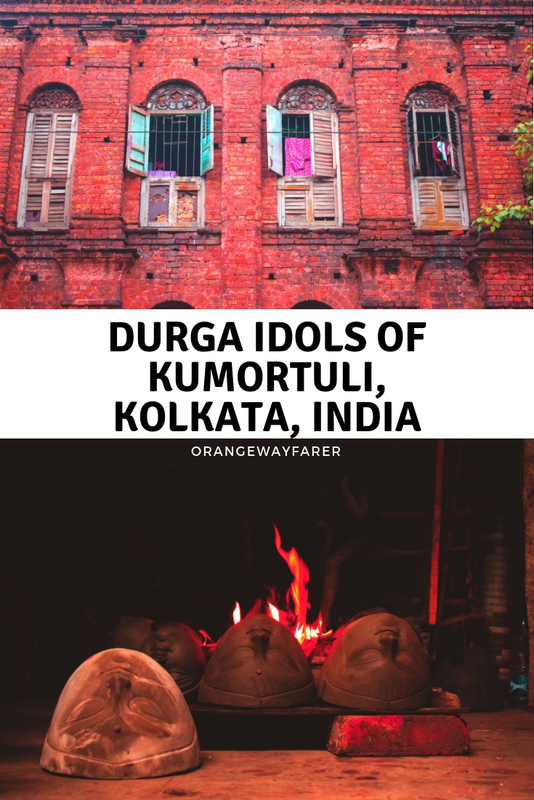 The History of Kumartuli: Where Bengal’s Durgapratimas is Born! Back in 1932, the Bonedi Barir Durgapuja (the Durgapuja celebration of royals) of Kolkata was slowly dying as British took off their interest and finances from the grandeur of religious celebration to elsewhere. The era stood witness to an eventual transit to the Barwari Pujas (a Durgapuja dedicated to one locality or the para, by the people, of the people, for the people). A cluster of Durga Idols on the make. Do notice the artist giving shape to the clay. The Gangetic clay is taken everywhere out of the banks of Hoogly to give a final touch to the idols, I learnt from the potters who work in the workshop at Cox Town, Bangalore! Legend has it Jagatseth’s money, Umichand’s beard, Banamali Sarkar’s house, and Govinda Mitra’s walking stick contributed to the idea of Kumartuli! All of them were the Zamindars from the days of yore! At Sayantan’s house, Durgapuja used to be a norm of the family. Traditionally the potter would come home, make an idol for days and the family will engage in worship. Legend has it the arrangements were devoid of a sheen on a particular year and caused death for a child in the family. They stopped Durgapuja at home. The potter went back to Kumartuli with his paintbrush wrapped in a Gamcha. A man furbishing the idol with a caring touch behind the sheets protecting from Kolkata monsoon! I often wonder, how does it feel to see the idols immerse after they have put in their hard work for days and nights? 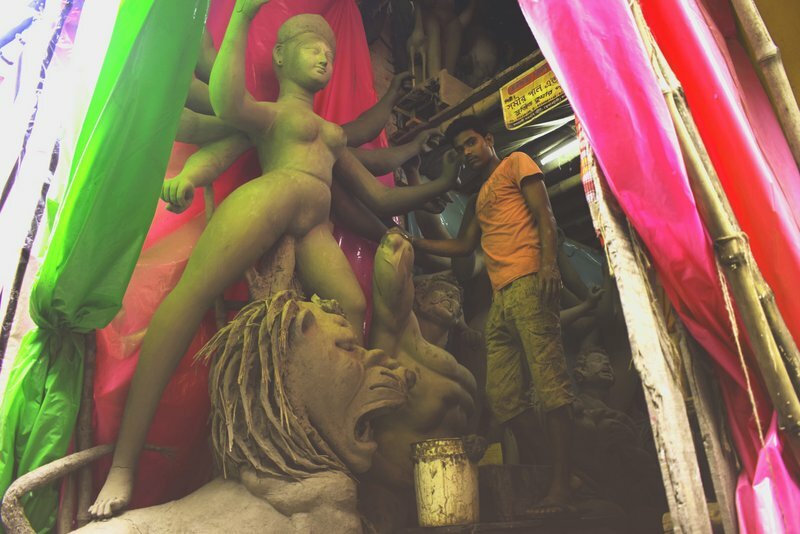 Also read, a photo walk exploring the Bonedi barir Durgapuja of Kolkata! Kumor Parar Gorur Gari (the ox-driven cart of the potters’ village)… our childhood rhythms in these Sohojpath lines by Rabindranath Thakur! Kumor (the potters) were the caste (and not in a casteist way) who excelled in the art of earthen wears! The sticky clay of Ganges melted easily in their hands, happily taking many shapes, further to be dried under the sunrays or burnt in the flames of fire. Idols were made and further painted for Life to be instilled. “Matrirupenu Sonosthitha!” A Sanskrit phrase calling the idol a mother! 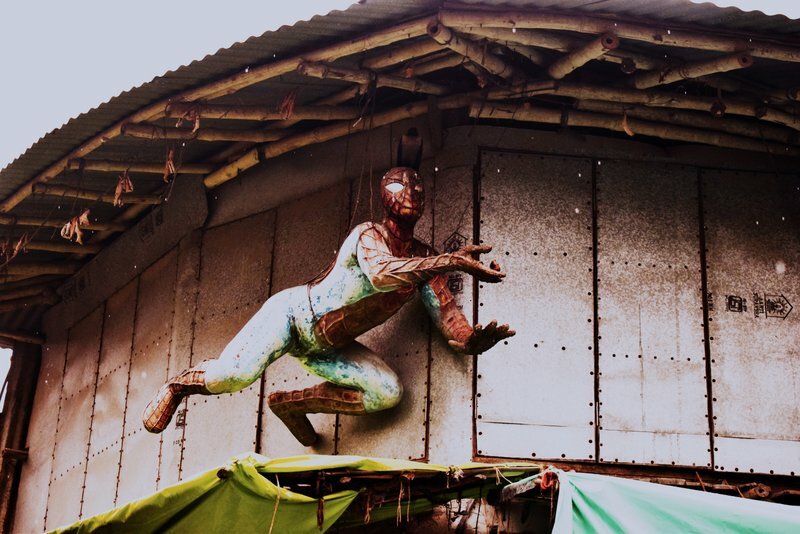 Spotted a spiderman at the entrance of Kumartuli! 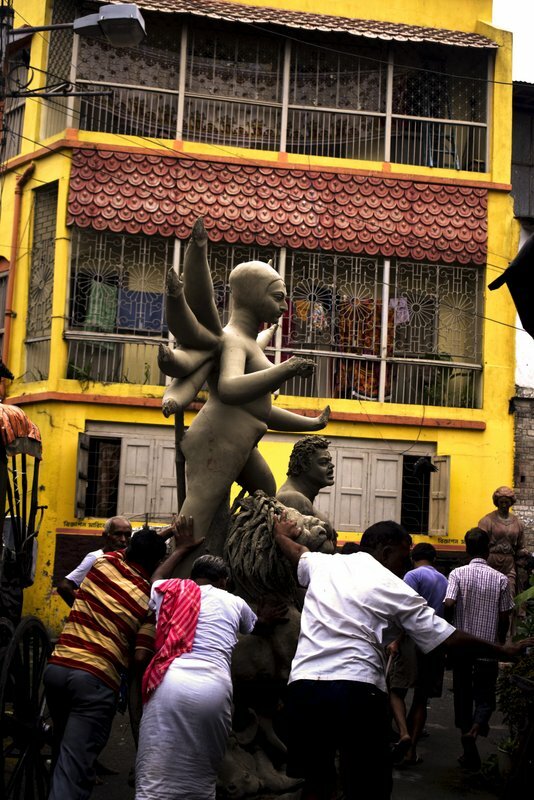 If you thought Kumartuli busies herself in making Durga Pratima only, think again. The world cup frenzy in the world gets their lifesized inspirations built and exported from this humble potter para in Kolkata! Also read, a melancholy named Durgapuja! The tradition changed with the advent of technology. The Kumor’s sons acquired varied skillsets and proceeded to different sectors of life. Like every other industry, a few artisans stayed true to their art. 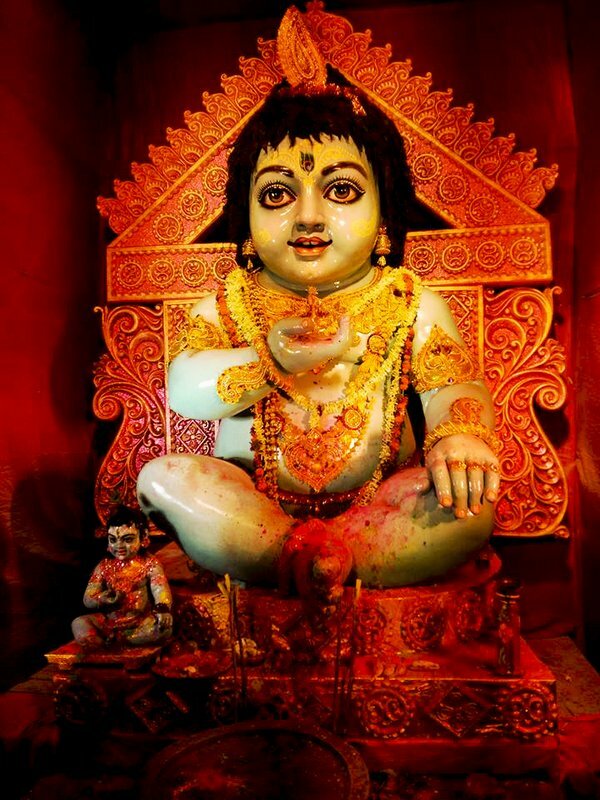 They sustained many blows of modernism, land encroachment and yet continued to create life in idols made from the entel maati (the sticky Gangetic clay). Dating back to the old days of British Raj in Calcutta, the soul of East India Company in the early 19th century, Kumartuli was a road frequented with palanquins, Babus and faithful devotees heading for the Ganga ghat (Coomertolly, the old-fashioned British spelling). From that, the transformation into a “photo walk hotspot” in Kolkata, especially prior to Durgapuja is a direct boon of technical prowess that rocked twenty-first century India. However, much like the photographers, technology had to stop at the door made of plastic and tarpaulin sheets of the workshop inside which potter sits, busy in idol-making in the dying light of a lamp. An Artist and his devotion to the work! He is making the face of Durga idol. Notice the upside down idol faces on the ground. A book on Kolkata I had loved! 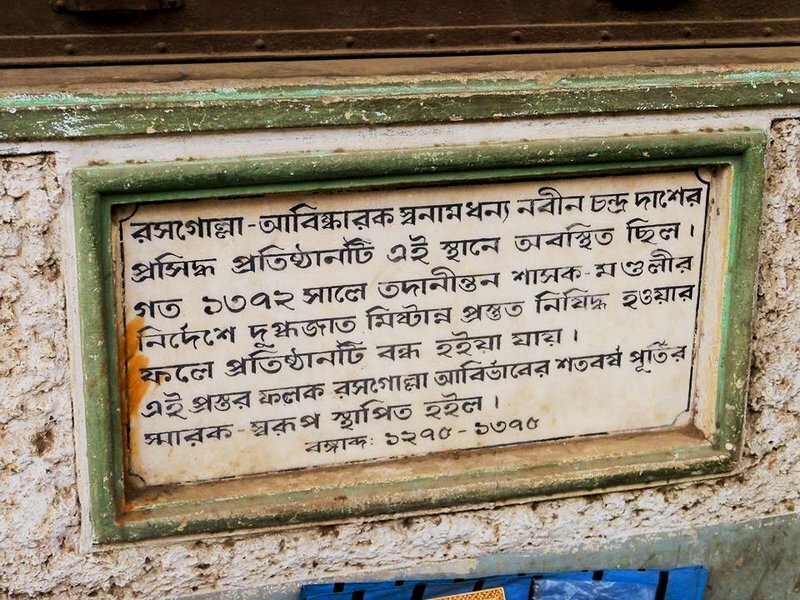 Legend says that the king of Krishnanagar appointed a potter to create a Durga idol to commemorate the British in of Bengal from the last Nawab Sirajudullah. Eventually, a lot more Bonedi baris pitched in for a Durga idol. 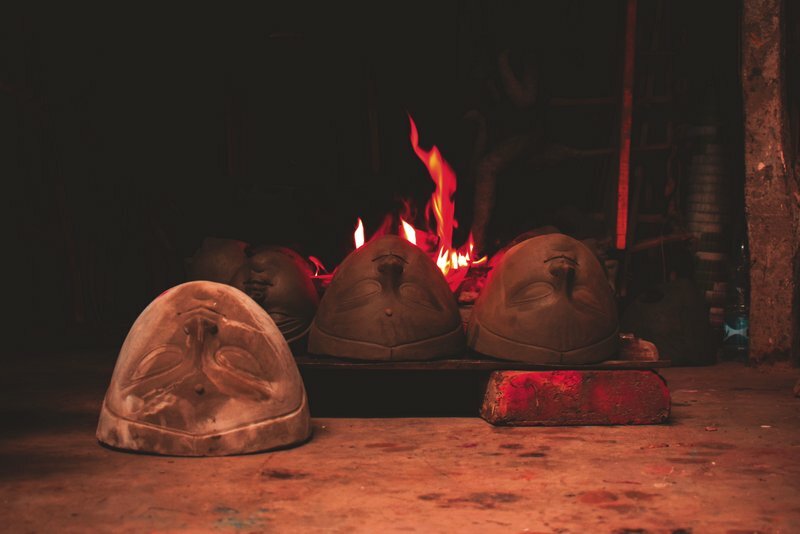 The potter was granted a land to start his business which grew up to be the sprawling Kumartuli as on today! Artists in Kumartuli stay grounded to nature. 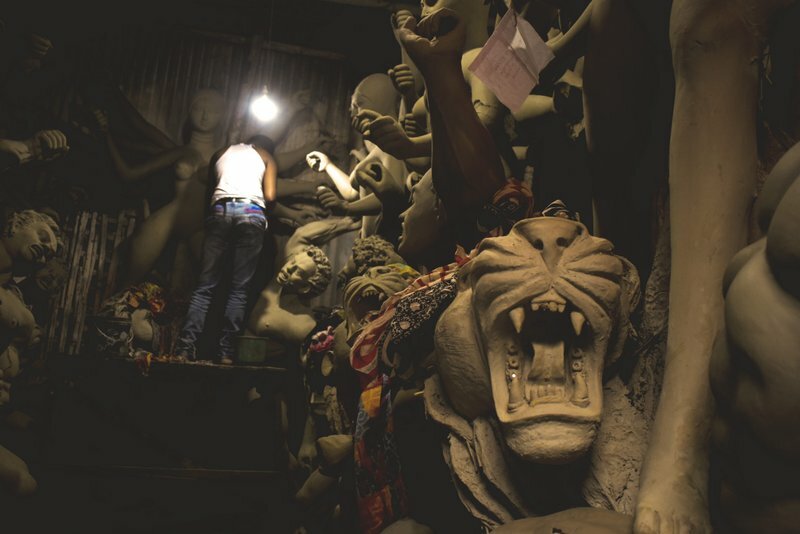 Clay from the banks of Hoogly, rains, sunshine and the humid heat of Kolkata are necessary ingredients used in Kumartuli to create a lifesize idol on the staw and bamboo framework! Post which the clay art is formed. It takes a while to dry up. 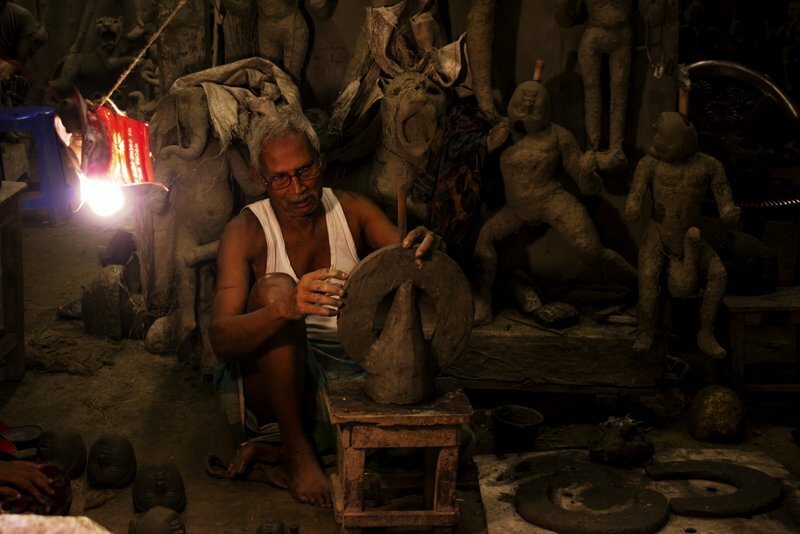 “Rain is our real Asur!” exclaimed an old potter as I was filming inside the narrow lanes of Kumartuli. Prolonged rained delays drying up, taking new projects and stalls the work as a whole. A Durga Idol riding on a lion and the Asur near her feet at Kumartuli on her way in search of sunshine? The bright sunlit days, on the other hand, speeds up the process. Meanwhile, the Idol’s heads are built and often burnt in the flames. Often, the heads and the body are adjusted with time. The process of creating Durga idol is time-consuming and can take anywhere between 3 to 6 months. The generic practice is to start the work from the day of Ratha Jatra, marking an auspicious beginning. The process begins with the potter worshipping Ganesh, believed to be Durga’s son! 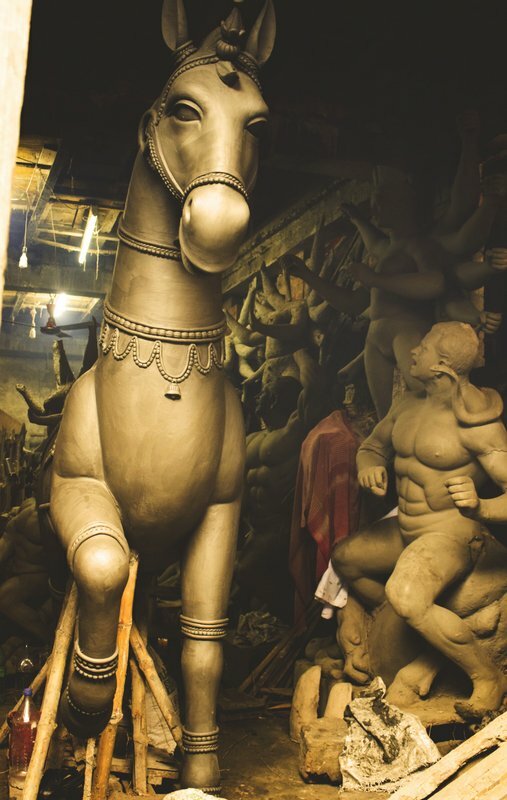 Found a Unicorn in the idol workshop at Kumartuli, Kolkata! The skeleton of an idol is made of straw, bamboo, jute and clay: everything organic and reused every year. 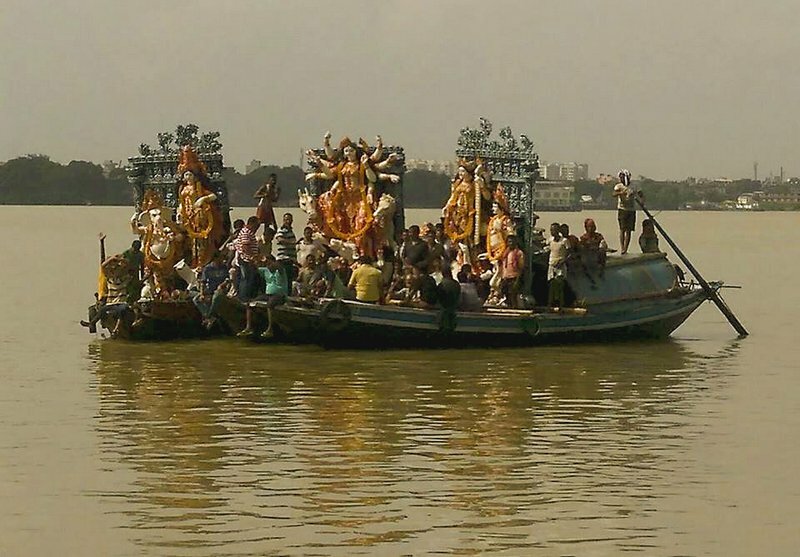 After the idol has been immersed in the water, the framework stays afloat, the clay goes back to the river/pond. 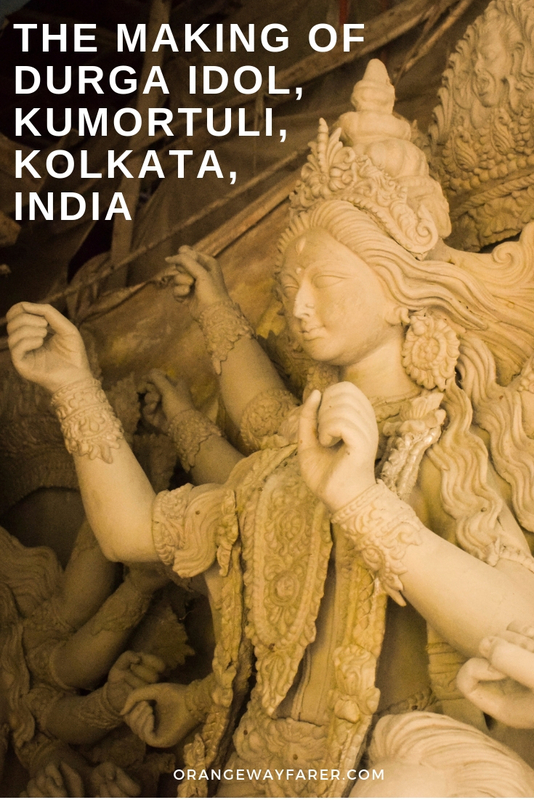 Kumartuli’s client portfolios have extended in different parts of the world. Antarctica is yet to be brought into the portfolio though! The workshop number hovers around 550. The number of idols being made is close to 15000. All are a rough estimate as procured from an artisan at Kumartuli. The New Age Practice of Choosing Organic Colour at Kumartuli: An Eco-Conscious Choice! Much has been talked about the colours used as a mode of painting for the Durga idols. The chemical induced in the colour palette had been polluting river Ganges beyond repair. Thankfully the new age artists have mostly shifted to eco-conscious choice for painting the idol. The Gorjon oil used to glaze the idol’s face is my favortite pick from the choice of organic materials on use. 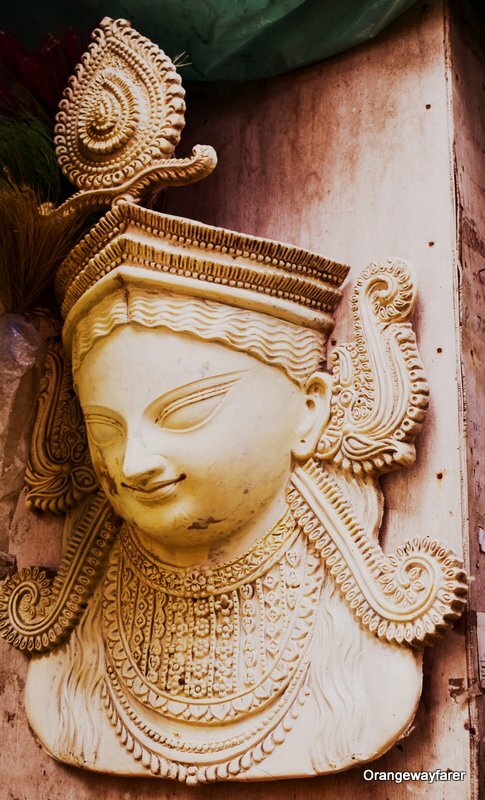 The intricate work on the face of Durga idol. Completely hand painted! Note the wide eye which is very specific to the Durga Pratima of Kumartuli, Kolkata. 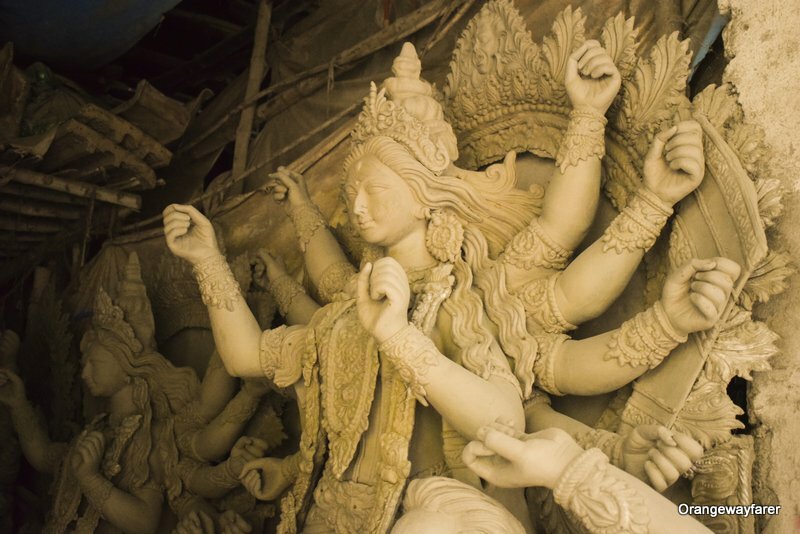 Daaker Saaj on Durga Pratima in Kumartuli! While the idols are made into many shapes and size, even abstract at times, the authentic Kumartuli Durga idols are meant to be decorated with Daaker Saaj. Daak is the Bengali work for mail. The silver foiled materials used to decorate the idols were imported from Germany via email! Sholapith is a material more in use by the commoners. Retrieved from a spongy plant matter, the ivory white shola emphasises the typical Bengali face of the idol, with wide eyes, vermilion on the parted hair, and the third eye! 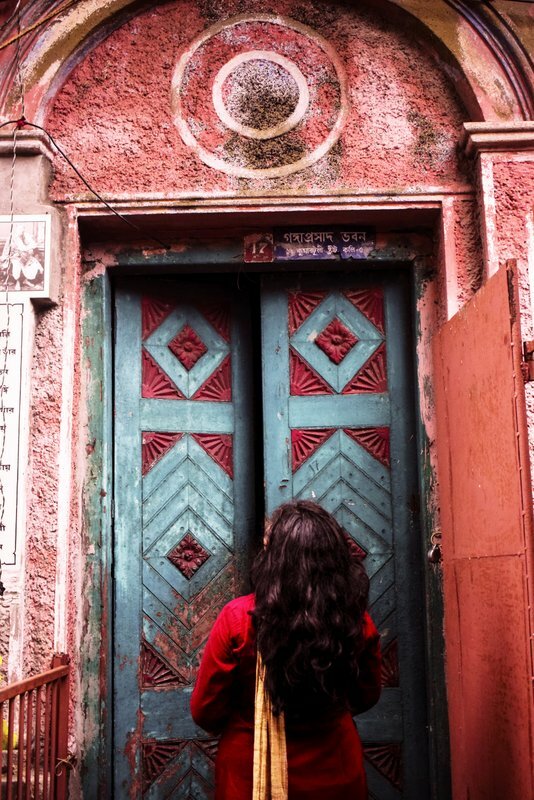 Appreciating the detailing of a door at an old Kolkata house at Banamali Naskar Lane, Kumartuli, Kolkata. We paid only 10 Rs to enter the Kumartuli Para. 10 Rs is all that you pay here to click the artists at work. Granted, the idols are priced steeply and sold worldwide, however, I took some time to settle with Rs 10 as “Unnoyon Chanda” for Kumartuli Somiti! The dwindling streets branches out into many workshops on both the sides. I went in July when the onset of monsoon rain had caused havoc on the work. We were told to stand outside the workshop and legitly so. The Entel maati was visibly wet. I could not risk breaking the lion’s teeth, could I? Durga idols are made first. Then the artists start making the children of Durga: Ganesh, Karthik, Lakkhi and Saraswati! 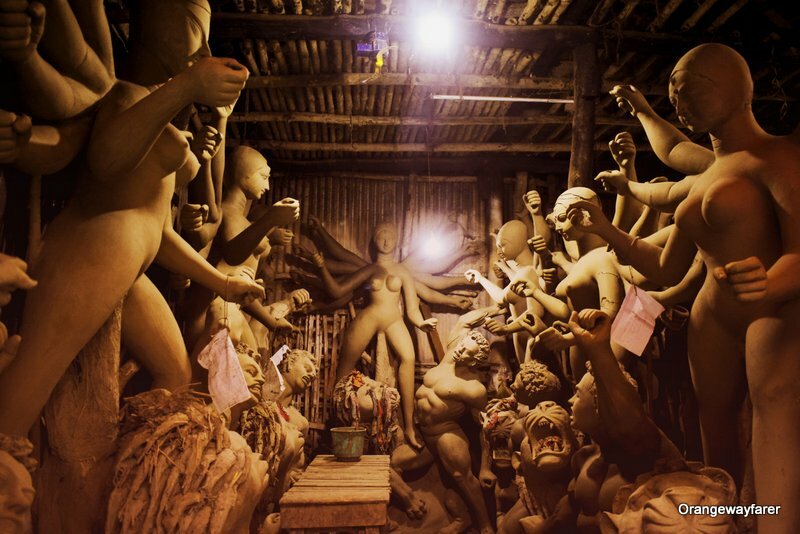 Breaking the Stereotypes: The Female Artisans of Kumartuli! 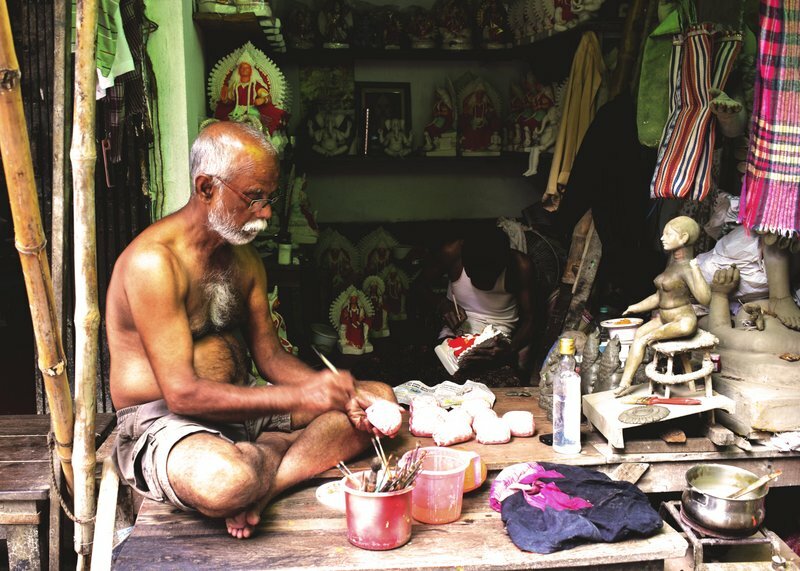 Even though the idol is a feminine identity, the workshops at Kumartuli is a men’s world. I could hardly find a woman at work. “Our women take care of the household!” The potters said. However, I found these names of lady artists of Kumartuli, China Pal and Maya Pal. A school drop out at the age of 15, Maya Pal has been recognised for her artwork for last three decades and won many accolades. Do look out for her when in Kumartuli. The lanes were accommodating to “outsiders” as well. A few Mass Comm students from Delhi University were shooting a short film. Their props included a hand-pulled rickshaw. The owner of the rickshaw was chilling by the sidewalk and smiling as the boys try to pull the historic mode of commute with all the force humanly gathered! A group of school children came to visit with their teacher as well. I learnt it is a part of “know your city campaign”! Besides Durga idols, artists also make Lakkhi for regular worship in Bengali households! The nearest metro station is Shovabazar Sutanuti. From Part Street or Downtown Kolkata, you can take a taxi to reach Chitpur area as well. If you are coming from the side of Howrah, take the launch to Shovabazar ghat and walk for a few lanes to reach Banamali Naskar Lane. Anytime prior to Durgapuja is the best time to visit to find the potters busy at work and capture the artistic prowess in your lens. 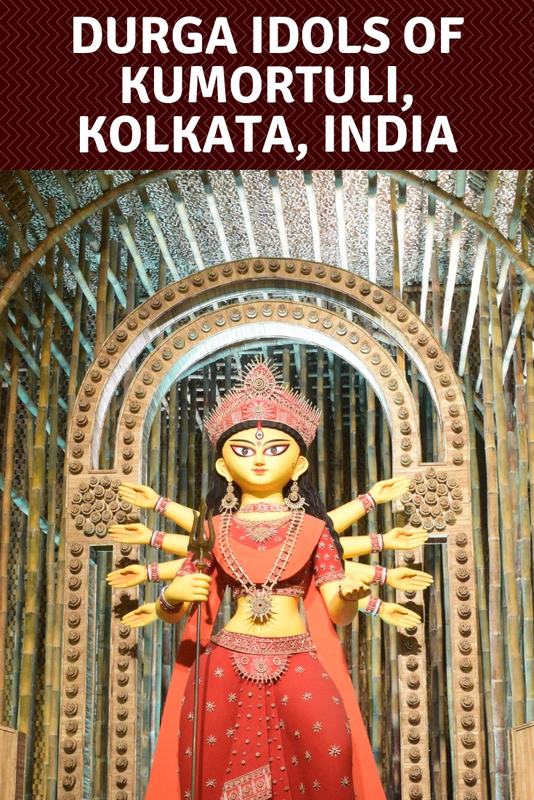 Dates around the event of Mahalaya are suggested since you can catch a glimpse of Chokkudaan (painting the eyes) as well as most of the Idol framework will be painted. Do understand, the closer the dates are to the event of Durgapuja, the more will be the crowd pull! 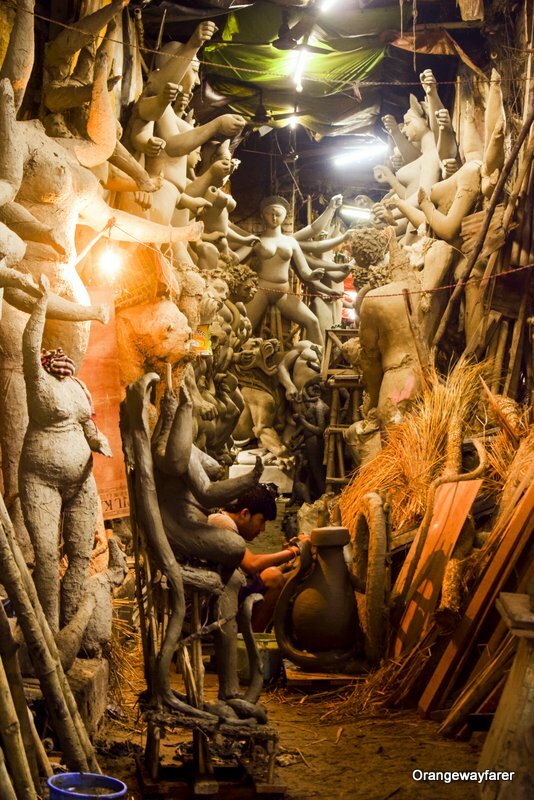 Beyond the Durga Idols, Explore Banamali Naskar Lane, Kumartuli! Kumartuli is situated at the heart of North Kolkata. Ask any Bengali about the charm of old Kolkata and you will be flooded with a soaring tale of nostalgic past. How the eminent personalities, the freethinkers of the old days, the pioneer of Indian renaissance had walked past these roads, how the buildings were made with care and passion.. the stories are endless! That said, you can soak in the grandness of Kolkata history only if you are familiar with the city! Suggested reads to acquaint yourself with the glorious past of Calcutta or Kolkata! An old house! Look at the windows! 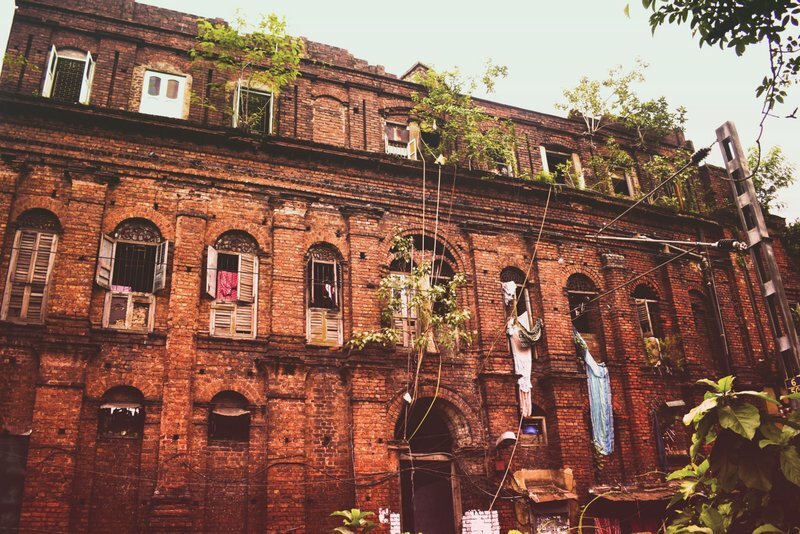 This house is supposed to be beside another famous old house of Kolkata named Putul Bari (Doll House) which is rumoured to be haunted! However, I suggest you walk past the narrow Kumartuli lanes. The legendary narrow lanes of North Kolkata will surprise you pleasantly! Watch out for the typical “bonedi baris” of North Kolata, hues in bright red, put into legal conflict by the heirs, housing the tenants who pay around INR 10 or 20 since time immemorial (yes, that’s a thing in North Kolkata), often tagged as haunted. Sometimes, Kolkata municipality has hung a board stating the house is dangerous and can break down any time! There are houses with a plaque in front, stating how Ramakrishna had visited one of his benevolent disciples. Unconditional love! 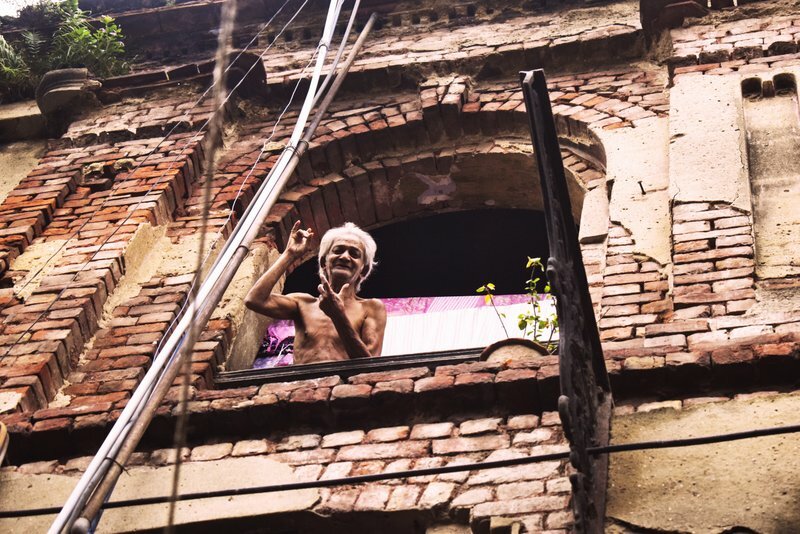 An old man greeting us as we were walking past the old lanes of North Kolkata! Reasons why I lobve the city! Watch the Kumortuli Vlog here! What an amazing post. Love the visuals. Brings back memories of CALCUTTA. Thanks for sharing this great post. The details on these idols are amazing! How cool to see them actually in the process of making them. I think my favorite is the unicorn. Such an interesting post! I have never heard of this before but after this post, will have to do some research about these idols. I love the photos showing how the idols are actually made, have never seen anything like that before. Such an amazing and beautiful post, filled with info and stunning photos. Thank you so much for sharing! I ve heard about the richness of the festivals of Bengal and all these idol making so much that I ve been mesmerised. Nice post with tons of details!